Water bombers are being brought in to fight one of two wildland fires burning in rural areas northeast of Edmonton. Water bombers are being brought in to help rural firefighters tackle hot spots in a wildland fire that has been burning since Saturday, said fire officials. "If the weather helps us at all, we have high hopes for today," Rob Singleton, chief administrative officer for Lamont County, said Tuesday. The fire, about 65 kilometres northeast of Edmonton near Bruderheim, was thought to be contained, but flared up Monday afternoon because of high winds, Singleton said. "It became pretty intense for a period of time," he said. "We tried to stop the fire from crossing [Range] Road 203 and we were unsuccessful." Crews from Andrew, Bruderheim, Lamont and Chipman worked from 2 p.m. until about 7 p.m. on the fire, he said. The hot spots tend to be in remote areas where it's difficult to attack them on the ground with firefighters, said Singleton. Heavy equipment has been used to build fire guards, and water bombers will attack the hot spots from the air, he said. "The wind got up quite high yesterday and could well do so again today," said Singleton. A second wildland fire near Bruderheim — but in Strathcona County — was being held as of Tuesday morning. Dozers have worked to create more than 12 kilometres of barriers throughout the area to slow down the fire, the county said in a news release Tuesday afternoon. Crews continue to work on the ground to extinguish hotspots and flare-ups. As of Tuesday afternoon, 15 firefighters, two command staff, four brush trucks, three dozers and three water tenders remained on scene. Residents at two of the three farms voluntarily evacuated were expected to return to their homes Tuesday night. The remaining farm is without electricity. No buildings have been lost. "We had some very, very close calls," said Bob Scott, deputy fire chief for Strathcona County. "Quick action by firefighters on the ground and quick helicopter work" saved the buildings, he said. Firefighters are prepared for the fire to increase, said Scott. "The fuel that's burning right now is very tinder-dry," he said. "It's the typical fuel we get in the springtime in Alberta." Since Saturday, the fire has burned about 600 hectares. 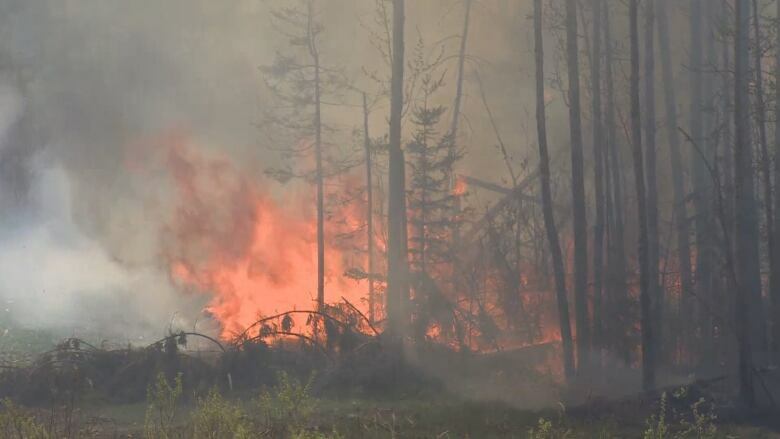 There were 26 wildfires in forested areas in Alberta as of Tuesday morning, said Matt Bell, Alberta wildfire information officer. Two are being held and the others have either been brought under control or turned over to the responsible parties, he said.